Sculpture’s key role in the Florentine Renaissance is the theme of “The Springtime of the Renaissance: Sculpture and the Arts in Florence 1400-1460” at Palazzo Strozzi in Florence through August 18 and the Louvre in Paris (September 26, 2013 to January 6, 2014). One of the show’s highlights is an early bronze by Florence’s Donatello, Saint Louis of Toulouse, which recently underwent extensive restoration. The larger-than-life statue was commissioned by the Guelph party as a tribute to the figure who renounced his claim to rule Naples to become a Franciscan. Louis died at 23 and Donatello depicts him with delicate boyish features in bishop’s regalia holding a putti-adorned crosier in his left hand and giving a blessing with his right. Enamel, rock crystal and fleurs-de-lis decorate his mitre. Donatello created the figure for the eastern wall of the church of Orsanmichele where both the sun and a classically inspired marble and gold niche added to its brilliance. But with the Guelph party out and the Medici in, veneration of Louis became politically incorrect and the statue was relocated to the Franciscan Santa Croce. There, without its correct perspective and stunning niche, the statue lost its impact. But thanks to recent conservation, the work is enjoying its own renaissance. Last year, in a workshop at Museo dell’Opera di Santa Croce, Ludovica Nicolai, the restorer who worked on Donatello’s David four years ago, experimented with a surprising new technique. Unlike David which was exposed to the outdoors for a relatively short time, the much larger Saint Louis had darkened from centuries of exposure. Both restorations have led to new technical insights about the artist’s process and strengthened his reputation for experimentation. 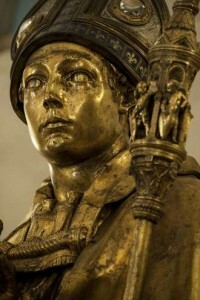 Donatello would start with the lost wax technique and then apply changes to some of his bronzes. For example, the metal alloy in David is different from traditional Italian Renaissance alloys and its surface was intentionally finished with tools that left different marks, probably to reflect the light differently. In addition to Saint Louis and a large bronze horse head, “The Springtime of the Renaissance” features the artist’s work in other mediums — including a gilded terracotta Madonna and Child and a marble predella of Saint George and the Dragon, his first use of “flattened relief” — the rules governing perspective. Outside of Italy, Donatello’s works are extremely rare. Just two reside in the U.S. — Madonna of the Clouds (ca. 1425-35) a marble relief at Boston’s Museum of Fine Arts and the terracotta Borromeo Madonna (ca. 1450) at the Kimbell Art Museum in Fort Worth, Texas.